Perfect location Near the restaurants, shops, supermarket, shopping mall, museums, etc. Great location Very good location close to good transport links and numerous bars / places to eat. 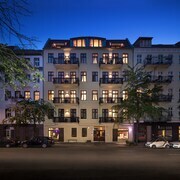 10-15 minutes walk from Charlottenburg station. Adenauerplatz is nearer. There,s a bakery across the street and a nice French cafe up by the junction with Kudamm. 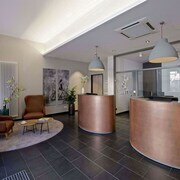 Reception staff were friendly and helpful. The room was comfortable, bathroom very clean. Would definitely stay again. Hyva sijainti. Siisti ja puhdas asunto jaakaapilla. Mukava henkilokunta. Hinta-laatusuhde kohdallaan. Voisin menna uudelleen. Nice family stay Not the best view but good location. The door of the Chinese restaurant kitchen always open to the elevator hall is a bit annoying. But once in the apartment it's fine. 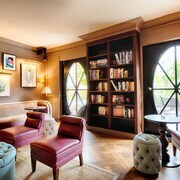 Fabulous apartment in a fantastic setting. Very helpful staff! Highly recommend. 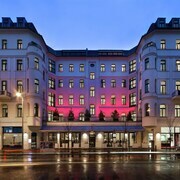 Fab location and very helpful staff Would return to this hotel, actually can't wait. Room just what you need and close to everything. Excellent location close to centre Excellent location close to centre and nice neighbourhood with plenty cafes etc. Some noise through night as next to busy road but would stay again. Plenty of space for large party of 8. Good place to stay, very nice large room great bathroom. It’s not a full hotel so don’t expect all the features. 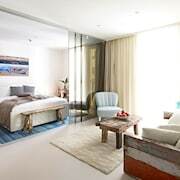 Clean and nice room. Quite far away from ”city”. Ubahn stop is close. The hotel is in good location. Most of the attractions are close by. 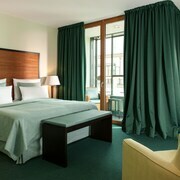 It is very clean and the beds are very comfortable. If something is not working it is sorted out quickly. The staffs are all very nice. 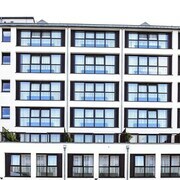 Schöne, großzügig geschnittene Apartements Wir waren rundum zufrieden. Netter Service, sehr sauber, gut ausgestattet und gratis Kaffee und Tee. What is it about Berlin that’s so beguiling? It might have something to do with its tumultuous history. One of the former battlegrounds of the Cold War, it still has an edgy feel which appeals to creative types and adventure seekers. Glamourous yet gritty, it draws in hipsters, clubbers, artists and foodies, not to mention history buffs who’ll be entranced by the architectural icons dotting the metropolis. 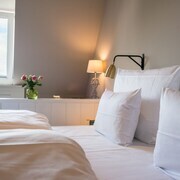 Berlin holiday rentals put you right in the heart of the action, so whether you’re here for the cool shops, innovative restaurants or decadent nightclubs, you’ll feel like one of the locals soon after unpacking your bags. 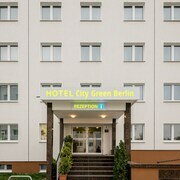 Why book Berlin holiday apartments with ebookers? 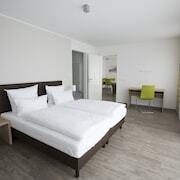 Whether you’re here for a short and sweet city break, or want to stay for a longer period and really immerse yourself in Germany’s endlessly exhilarating capital, Berlin holiday rentals offer many advantages over hotels. For one thing, you’ll have a lot more space to play with – why limit yourself to a single guestroom when you can enjoy a large living area and your own fully equipped kitchen? It’s also likely to be a lot cheaper than splurging on nightly hotel rates. With ebookers, you’ll have your pick of potential pads, including a tempting variety of Berlin holiday rentals in the central Mitte district, putting you a short stroll from so many iconic attractions.
. How about the Reichstag building, with its gleaming glass dome? Or perhaps you want to soak up the never-ending energy of the city in the Alexanderplatz, a square immortalised by the book Berlin Alexanderplatz and its movie adaptations. For a different view of the city, you can ride up to the top of the Fernsehturm, a futuristic television tower whose observation deck offers sweeping vistas of this historic metropolis. Fancy some retail therapy? You can go for a promenade along the Kurfuerstendamm, an epic avenue laced with boutiques and bars, which has been compared to the Champs-Élysées. No visit to Berlin would be complete without a stroll around the Brandenburg Gate, which has witnessed the march of history over the turbulent centuries since it was built. Then, let your hair down in the wild nightspots of the hip Friedrichshain district. Thanks to the U-Bahn, there’s no excuse for not packing in plenty of sightseeing during your visit. Its underground trains make it easy to flit across the various quarters, though you can see plenty of the city’s core on foot. On top of that, there’s also an extensive network of buses and trams, which makes life even easier for the intrepid urban explorer. If you’re here for a longer period and fancy getting out and seeing more of Germany, you can also look into hiring a car, which will give you the freedom to roam as you feel like it.